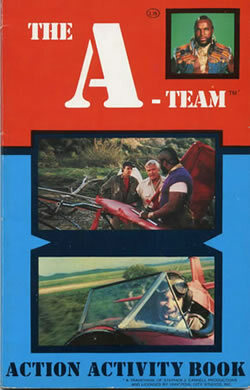 The 1983 A-Team Action Activity Book featured three or four dozen exciting word games for young fans of the television show -- and by "exciting" I mean "so simple a trained monkey could do them." I think this book was actually my brother's and it appears that it was completed in one sitting as every page is marked with a green magic marker. The book is packed with illustrations; however, it's mostly the same handful of illustrations reused again and again from page to page. 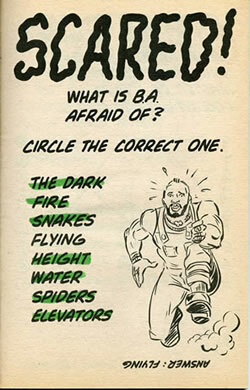 I realize Murdock is supposed to be a little off his rocker, but check out the drawings below. 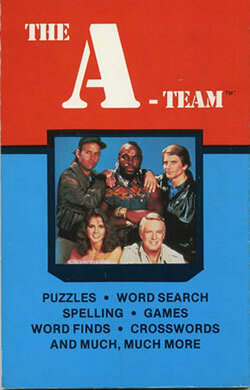 I think there's a fine line between "Howling Mad Murdock" and "I'm-about-to-kill-you Murdock." 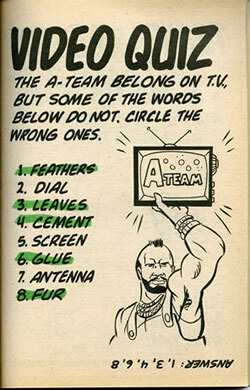 Here's a small taste of the educational goodness found in the A-Team Action Activity Book. Take special notice of the Video Quiz as two of the correct answers would likely be incorrect by today's standards (dial & antenna). On the inside of the back cover is the beginnings of a pretty sweet pencil drawing of Volton compliments of yours truly.